Women’s History Month begins on March 1 every year to recognize and celebrate the contribution of women to monumental and ground-breaking moments in history and how women will contribute to events in the future. This year, the theme of Women’s History Month is ‘Visionary Women’, and who fits this theme better than the women who fought and still fight for women’s suffrage? The team at Historic Newspapers have put together an interactive timeline which highlights the key dates in the history of women’s suffrage, and uses graphics and images to describe women’s right to vote. 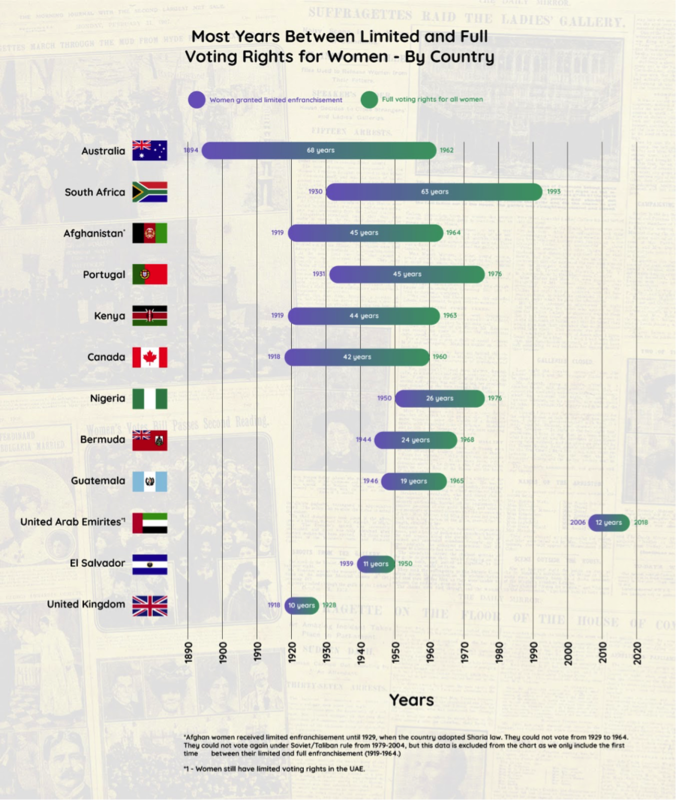 Gaps between when women were given limited and full voting rights by selected countries. Image produced by, and re-printed with the full permission of, Historic Newspapers, available here. The fight for women’s suffrage, or the right for women to vote in general elections, began in the late 1800s and has continued ever since. After a phenomenal struggle, with campaigns both peaceful and forceful, changes started in New Zealand in 1893 when the British colony made the first steps in granting women the right to vote. Unfortunately, women all over the world are still fighting for the freedom they deserve. With the Vatican City and the United Arab Emirates still not granting voting rights to their female citizens, the fight for global suffrage for women still exists. In the majority of other countries women do have the right to vote; however due to strong stigmas held in some societies, it is a constant struggle. Something that is not spoken about enough is the disparity in the date women were granted limited enfranchisement and the date that women received full voting rights. Broken down, this means that although some women were given limited rights to vote, it may have taken decades for this to be granted to the full female population and across all aspects of voting. Women’s suffrage has made progress over the decades, however oppression in women still exists and there is a long way to go before equal rights will be attributed globally. This Women’s History Month, take the time to read, learn and talk about what needs to be done in the future, whilst remembering the visionary women of the past.